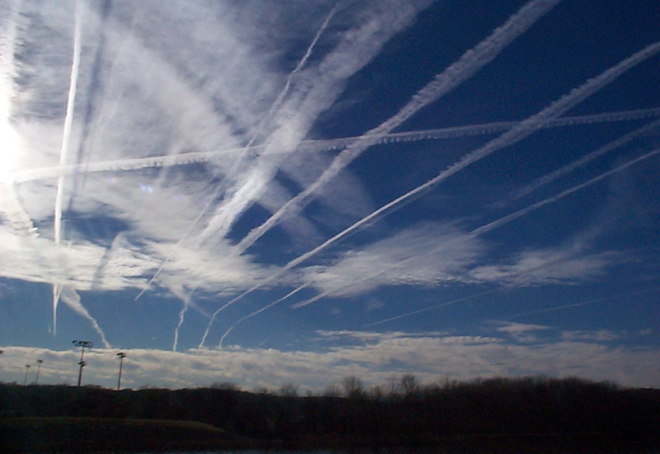 Is Geoengineering Pushing Us Into Climate Chaos? Start with something dynamic, like the weather and its increasing propensity toward sudden, drastic and lingering surprises. As the geologic record of mass extinctions repeatedly shows, if pushed too far by various atmospheric forcings (like mass methane releases or meltwater shutdowns of ocean circulations), the longer-term weather patterns we call climate can change drastically, for a very long time, within a decade. Or a year. Geoengineers understand that complex weather behaviour emerges from a few simple initial conditions. Change those conditions along a broad atmospheric front by deploying aerial refuelling tankers to spread particles that accrete moisture and scatter incoming sunlight, absorb energy from ionospheric heaters like HAARP, or rapidly cool air masses by dispensing ice-nucleating chemicals like an aerial flash-mob –and you change the heat balance of that airspace and thus the resulting weather. Do this repeatedly, spreading megatons of atmospheric-forcing particulates behind hundreds of heavy aircraft for many years and even climate can be altered. each spreading 200,000 pounds of aerosol particles one-tenth the diameter of a human hair along a flight path traversing thousands of miles. With our compounding emissions already shoving heat and humidity in some places to the edge of liveable limits, geoengineering is the unwelcome bully that threatens to jerk the trigger on looming abrupt climate shift. Earth's climate system is chaotic enough to turn occasional stumbles into full-fledged flip-outs. So the last thing anyone would want to do is to trigger such an upset with planeloads of monkey-wrenching aerosols. To elevate such planetary roulette from blind swings at a constantly shifting atmospheric piñatato a reliably predictable science, the desired weather/climate output must be proportional to each atmospheric modification input. And the resulting atmospheric events must also react the same ways every time. That's why we call such predictable progressions, linear. But the atmosphere, like life, is so nonlinear. Every time you start your four-wheeled carbon burner, you're a geoengineer. Every time a commercial airliner climbs into the stratosphere, all onboard are geoengineers. Ditto that coal-fired power plant down the street. The big difference is, it's your choice whether to turn the key, board that plane, or join a citizens' group demanding clean energy. As for your input into whether those jets overhead continue dimming the sun – not so much. The result of all this inadvertent and deliberate atmospheric forcing is climate chaos. “Chaotic” means “unpredictable”. Punch-drunk by our ever-accumulating heat-trapping exhausts, at least 17 years of concerted geoengineering efforts, a wonky jetstream, and dozens of amplifying feedbacks from thawing tundra, clearcut forests, burning forests, melting ice sheets and the world ocean's expanding heat reservoir (to mention only a few) – it's no wonder so much inconvenient weather is lurching across this planet. With global warming causing more global warming, how do increasingly destabilized weather systems respond to deliberate further prodding by targeted laydowns of particulates powerful enough to disrupt air masses and soak up residual moisture like a sponge? Nobody knows. The atmospheric predictions produced by our best supercomputers crunching incomplete data that ignores climate feedbacks and geoengineering are falling further behind the alarming headlines resulting from a churning complexity that is ultimately unknowable. Given all the still-uncalculated feedbacks we've set in motion, most notably geoengineering, it's not surprising that climate changes continue to outpace our models. Any climate activist or scientist” who continues to ignore these well-documented aerosol assaults is working with a seriously flawed premise. So what does climate chaos look like? are spreading solar heat-absorbing ash over vast stretches of the once reflective far north.  It looks like meltwater-formed shallow lakes acting as lenses across the tundra, focusing sunlight into thawing even more super-warming methane.  It looks like the 80 devastated islands of Vanuatu, where I once sailed my trimaran and where half the population has been left homeless by Cyclone Pam.  It looks like that blocking high over Brazil, where Sao Paulo's 11 million residents face the prospect of dry taps. Another 33 million people in the Sao Paulo region fear the same fate. And they are not alone.  It looks like the sea level rise that has driven 100,000 people away from their Indus River delta farms due to repeated flooding and saltwater contamination of the water table. As Rutgers University professor Jennifer Francis explains, the loss of reflective sea ice and resulting heated rising air from dark waters is producing a northward bulge in the jet stream that builds high pressure in the east. Winds flowing “downhill” from this stubborn high are bringing cold Arctic air southward into eastern Canada and the United States. Meanwhile, that persistent high pressure dome off the US west coast is flowing warm, wet air north into Alaska, where the internationally renowned Fur Rondy sled dog race“due to warm weather and heavy rain.”, held every year since 1946, cannot mush. So is atmospheric warming or geoengineering responsible for California's thirst and Alaska's failed winter? The answer: Both are so intricately meshed, it's no longer possible to distinguish one from the other. We dare not continue a mad experiment that artificially desiccates air masses in order to theoretically slow skyrocketing air temperatures. If Hansen's right, geoengineering is not working. If Travis is correct and we stop spraying particulates (whose tiny 10-micron size is deemed an Extreme Human Health Hazard by the EPA), we face a significant instant temperature jump in a feedback-sensitive atmosphere already heading toward a 4°°-6C rise over fast-looming decades. Are your children down with geoengineering continuing to grease the skids into extinction? While many point to geoengineering as the culprit behind the ever more intrusive climate change they otherwise deny, and geoengineers use “climate change” to disguise the climate chaos they're inciting, the fact is that nearly two decades of large-scale geoengineering have erased the baseline by which we might measure climate impacts and gauge their rates of change. The geoengineers are "saving us" to death. Putting our planet's life-support on geoengineering life-support that can't be turned off without an instant spike in temperatures is not a wise idea, Naomi Klein suggests. Chaos Theory and its offspring science of Complexity show that when unstable systems are pushed past critical thresholds, they lock into amplifying feedbacks. When the dust finally settles, the resulting “phase-locked” equilibrium is always a much simplified state. Examples include disappeared rainforests flipping into deserts, a once-teeming ocean turning into a vast acidic dead zone, seasonal regional climates suitable for agriculture and human life “simplified” into uninhabitability, and seawater inching towards 634 million pairs of human feet. 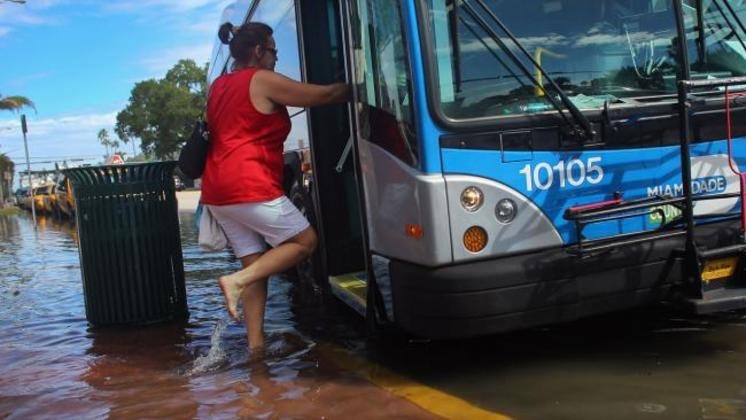 Before we can agree on a global response to climate change, geoengineering is providing another big push toward the kinds of social breakdown stalking Miami Beach, where “slimy green saltwater” from rising seas is filling streets, blocking doors, ruining vehicles, and inundating shops and homes. Instead of buying time, every aerosol mission is reducing the time left to act. And by obscuring the true pace of climate change under veils of artificial clouds and 40°F snow, the geoengineers are making it much harder to respond. Every day the aerosol tankers fly, politicians beholden to Big Oil can delay meaningful action. And make a Canfield ocean and abrupt climate shift more likely. So I modestly suggest: Indict the geoengineers for reckless planetary endangerment. And ground the tankers now.